Spatial Directions has submitted an entry for the remodelling of the Northbourne Flats site in Canberra run by the ACT government. 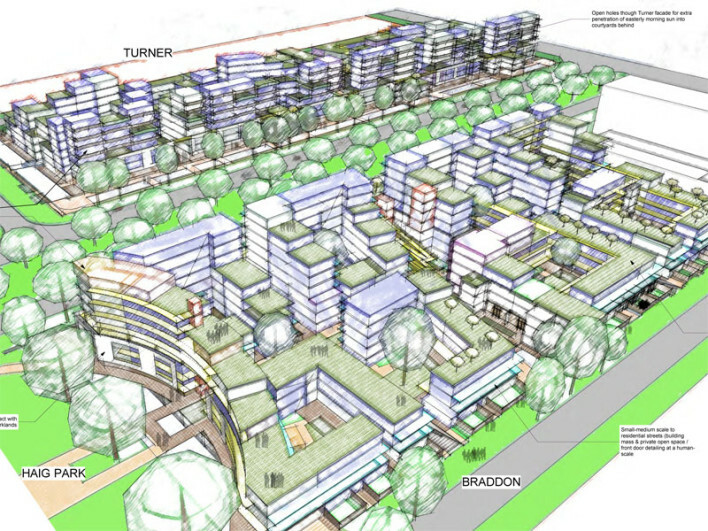 The brief was to provide 900-1000 housing units over the two sites. Our design approach was to achieve as low-scale, socially-minded solution as possible (given the required yield). The sites were broken down into micro-community blocks based around courtyards to maximise natural light, ventilation, site permeability and opportunity for social interaction. Each site was given a central theme (water & park) to bind the blocks together. A variety of different medium-to-high density living types was provided (3 storey walk-ups to high-rise apartments. These were vertically stacked to suit solar orientation, reflect the change in urban scale from the main artery of Northbourne Avenue to the more residential streets behind and to give all dwellings access to open space, including the generous provision of roof gardens.